For the current site: You can change the handling rules for the main list of elements in the Protect toolbar. For all sites: You can change the handling rules for a broader list of elements in your settings. User location When trying to determine your location, the browser will ask you to allow data transfer. 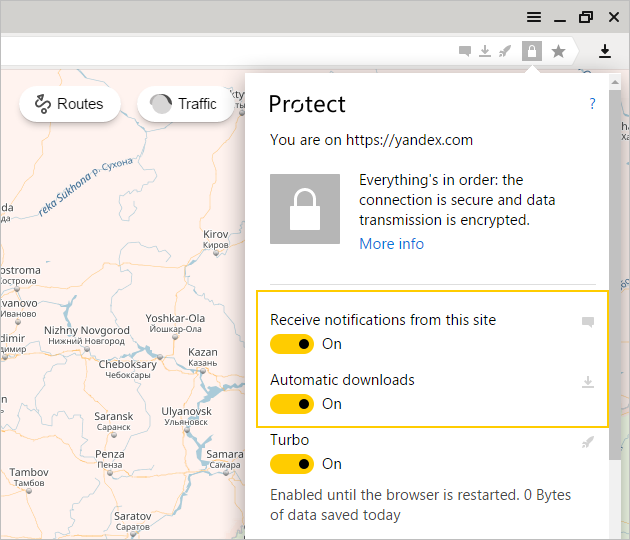 Allow — lets a site (like Yandex.Maps) detect your location without asking for permission every time. Block — does not allow the website to determine your location. Camera If a website (like a platform for video conferences) tries to access your camera or microphone, the browser will warn you. Allow — lets the website automatically access your camera. For an HTTP website, this setting will remain for the duration of your session, while HTTPS websites will be able to access your camera during future sessions as well. Block — does not allow the website to access your camera. Microphone If a website (like a platform for video conferences) tries to access your microphone, the browser will warn you. Allow — lets the website automatically access your microphone. For an HTTP website, this setting will remain for the duration of your session, while HTTPS websites will be able to access your microphone during future sessions as well. Block — does not allow the website to access your microphone. Notifications When you go to a website that sends you notifications, the browser will ask you each time whether to show them. In Incognito mode, the browser blocks notifications from all websites. Allow — lets a website (such as Yandex.Calendar) show notifications. Block — does not allow the website to show notifications. Plugins Runs content for all plugins. Detect content — the browser will only block plugins that do not relate to the page's main content, like Flash banners on a sidebar. Block — do not allow plugins to run automatically so that you can block vulnerable and dangerous plugins. Images All images are shown. Block — does not allow website to show images. It will load faster without images. Pop-up windows They are blocked on all websites because they clutter the screen and are often used for banner advertisements. If the site tries to open pop-up windows, the SmartBox displays the icon. Allow — the website will be allowed to open pop-up windows. Background sync Device syncing occurs in the background. Block — prevents background browser syncing on all devices. Automatic downloads The browser will warn you if the website tries to download a second file immediately after downloading the first file. Allow — lets the website automatically download multiple files without asking for permission each time. Block — do not allow the website to download files, except for those you have selected. MIDI devices The browser will warn you if the website requests access to electronic musical instruments using the MIDI interface. Allow — grants a site automatic access to MIDI devices. Block — does not allow the website to access MIDI devices. Password protection Password protection is enabled automatically the first time you enter identical passwords. Enabled — password protection enabled on current site. Protected mode Protected mode is enabled by default when you open internet banking and/or payment system websites. Enabled — protected mode enabled on site. Disabled — protected mode disabled on site. Cookie files Cookies can be saved. Block — you can block a website from collecting information about you (such as username, password or browsing data). Blocking cookies can prevent the website from working correctly. For one session — cookies will be deleted once the browser window is closed. Handlers Protocol handlers (for example, webcal or mailto) are allowed to operate when special links are open. Prohibit — doesn't allow protocol handling on all sites. Protected content When protected content (such as e-books, films, and music) is open on your device, the device ID is checked by default. Prohibit — doesn't allow device IDs to be checked when license-protected content is open. Plugin access to computer All plugins launch inside the test environment by default. If you open an infected page, malicious code can't move beyond your browser and infect your computer. Sometimes a plugin needs access to a computer outside of the test environment, such as in cases of video streaming. In this case the browser will ask for your permission. Allow — allow the website to use plugins to access your computer. Block — do not allow the website to use plugins to access your computer outside the test environment. USB devices You can connect a site to a USB device (in order to, for example, save heart-rate monitor data found on a webpage). Using the Customize button, you can view and customize connected devices. Full screen mode If a website tries to toggle full screen, the browser will warn you about it. Allow — allow the website to toggle full screen without asking your permission. Cursor blocking If a website (like an online game) tries to hide the mouse cursor, the browser will warn you. Allow — allow the website to hide the cursor without asking your permission. Block — do not allow the website to hide the cursor. You can change an element-handling rule for the current site in the Protect toolbar. Find the site element in the Permissions section. Select the option you need in the drop-down list: Block, Permit, On or Off. Then you will see that option for the changed element in the Protect window that appears. It is easy to turn an option on or off, but this setting will only apply to the current site. Set your element processing rules. If browser rules interfere with how you use a website, you can set an exception for that site. For example, you can allow Yandex.Maps to determine your location automatically, but have all other sites ask for your permission. In the section with the name of the element you need, click Manage exceptions. Select from the drop-down list: Block, Allow, Session only or Detect content. In the line with the desired site, click .